A workout station at curves. As I posted Friday, I joined a gym. To be specific, I joined Curves. I love that I can go there and just use the machines and follow the video for cardio, all without really thinking about it. The trainer tells you when you’re doing it wrong (as I so totally was, over and over this morning) and so you can be sure that you’re not doing something stupid that will hurt you. LOVE THAT! So this morning, I went in and got started. They have these smart card machines, that I will eventually get to use my card on, that gauge how well you can do a certain machine and will level you up as time goes on, making your workouts harder in specific ways as you progress towards even more fitness. I love that I don’t have to keep track of that. It sounds fantastic. But first I get to spend a couple weeks getting used to using the machines and getting my strength & speed up so the machine will recognize I’m doing something. (I did have a moment this morning where the trainer said “Are you just extra tired or what? !” and I gently reminded her that a) I had RA and b) it’s been about two years since I’ve done any working out at all, really. Baby steps, lady. Baby steps. I’ve been fairly fortunate with my Orencia infusions insofar as side effects go. I’ve been on it since October and this is my first sinus infection. I’ve felt a couple trying to start in the past few months, but I’d been diligent in the past about rinsing my nose out as per the doctor’s orders and resting up. Not so, this time. I was super busy last week with book fair (oh how I love talking to kids about books!) and PTA events (serving BBQ at the Fine Arts Night my kids were singing, dancing, and signing at) and a kindergarten field trip to the planetarium (Did you know there are kids out there scared of outer space?! I had no idea.) and the church’s regional weekend (I signed on to do crafts, which is far and beyond easier than working in the kitchen), so I wasn’t really ever home long enough to do more than eat, sleep, and change clothes. Hence the sinus infection. 😦 So tomorrow I go in for yet more antibiotics and hope that this clears up before my next infusion. I also finally get to check in with my OB/GYN about the menstrual issues. I had blood work drawn last week for this appointment. Sorry for all the cross-posting lately if you are someone reading all the blogs, but this is the way things are right now. Last week I hosted a girls game night with my little group of friends. We never did actually get to the games, but we had a good time eating snacks, drinking wine, and catching up on things. 🙂 It’s a nice group of gals, most of us are some kind of writer or artist. 🙂 We’ll try an actual Gaming game night another time (soon, I hope). The next night we had a Robert Burns Night with my parents where we read the poetry of Robert Burns (well, Nick did, but that’s because he had the best Scottish accent) and had some traditional Scottish foods (but not haggis). Saturday I got the bad news about my friend and had a complete meltdown and stayed at home and cried and drank wine and watched movies all day. So cathartic. Sunday the kids practiced basketball while I fixed up my desk area where the by-hand writing goes on. 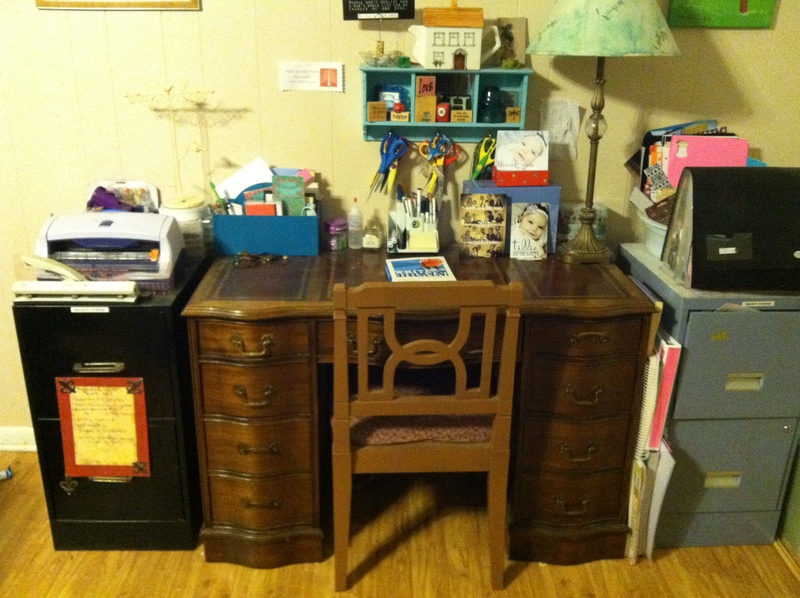 It is tidier and makes the writing go better since I’m not scrambling for pens or notebooks. I’ve tidied up my computer so I know where the files I’m currently using are and I’ve set up a profile for everyone else so I can have mine be whatever I want and don’t have to worry about boy eyes on my things and them getting confused by the voice control setup that I’ve been using. I have been writing this week. Lots of writing and writing related stuff going on. Working on two novels and a few sad poems. I’m enjoying flipping through old notebooks and files of writing from a couple years ago to see what I would’ve written had I not fallen off the writing track. It’s fun putting stories together again and for that I am very very happy with the universe. Monday I got a call to work, but had stuff to do at home that desperately needed doing, so I said no and got all my stuff done. Tuesday I also got a call, but had to say no because I was taking David to Dallas to have his X-rays done again and to see if he needed another shoe lift or what. He doesn’t need a new shoe lift, he needs surgery. Oh yay. Probably next summer, but we’ll do another set of scans between now and then because it’s more data for the computer to look at and more data means more accuracy and more accuracy means a better outlook and that could mean putting the surgery off another year and another year could mean a stabilizing of the irregular growth, which could lead to no surgery. So we’re waiting. Wednesday I was all ready for the call to work. I got up, made myself lunch, dressed in subbing clothes….and no call. Of course. So I did laundry, cleaned the kitchen, and let myself have 2 hours of lovely writing time. It was glorious. Yesterday was my friends funeral. It was a good one, I think. I sat with my friend Dana. They had to add extra chairs on the sides to accomodate all the people. The first person who spoke was a bit conflicted, but Shannon’s sister and dad and regular pastor got up and said some wonderful, understanding things about the nature of depression and the challenges of living with this disease. It was all very heartening and uplifting. I couldn’t stay to go to the graveside service, as I had a PTA meeting. The meeting was very short, which was unusual for us this year. I spent the next couple hours doing work for the next months worth of activities and went to get the kids. We’re trying out Choremonster.com for our chore rewards website right now. It looked fun and came highly recommended and the kids are excited about it, but I’m finding it very trying. I had to set up each kid separately with separate logins and separate jobs and separate rewards and I have to log back in every single time they finish something to approve it and it is constantly sending me emails telling me to “Hurry quickly!” like I don’t have anything better to do than use this clunky interface to approve each child’s chore. AIE. Plus there’s no calendar to look at or afix things to. You have to just know when things are going to fall on (plus there’s only a few options for days and I need a “every third day” option since I have three people). Already! 🙂 They were ALL NORMAL!! Liver function, good cholesterol, bad cholesterol, kidney function, blood count, thyroid, everything else in the universe, all normal. So we’re doing a happy dance and I don’t have to go back until July. I called the office and asked if there’s any further testing for this so-called “heart condition” and was told just to keep on keeping up with my health journal and if I have anything scary happen chest-pain-wise to seek the nearest emergency room. 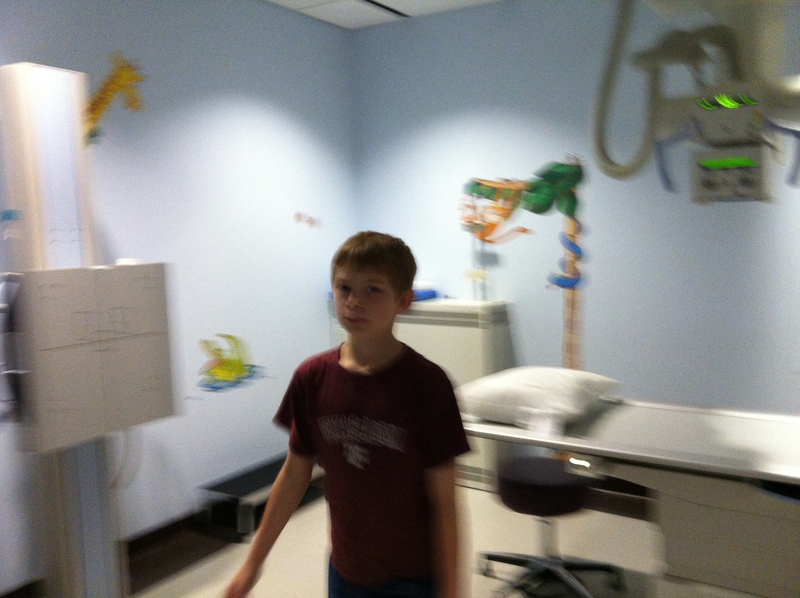 January 17, 2013 Lisa H.
Physicals, or check-ups as I like to call them, are so delightful. This time around they had a totally new computer system that wanted to know my height and blood oxygen levels and whether I was left or right handed. Woo hoo. Apparently I’m an inch taller than I think I am. I pointed out that the last time I’d had my height measured I’d been 18 and barefoot, but the nurse did not care. 5 foot 5 is my new height. It’s in the computer so it’s official. Well, okay, then. – More blood work. Fasting. Tomorrow. Oh yay. -I have a heart condition. Undescribed. Awaiting some test results. No big deal. Umm…. – (back to the weight loss woes) “… you can’t have drugs to help that along.” I can, and should: walk, do low-impact exercise, swim, etc, and eat healthy. Which I’m already doing, but I’ll try harder. Maybe I’ll just travel everywhere with whole grain bread and tea and carrots. Why not? – The doctor checked EVERYTHING, even my swallowing and listening to my throat at rest. I have no idea what that was about; he’s never done it before and frankly at this point I couldn’t handle anything else. – My left side is way less limber than my right side. (Wherein I realized that my rheumatologist never does range of motion checks any more. Hmm.) Arm, leg, protesting. Which is weird because it’s my less grouchy side, at least the side that generally hurts less. I think that’s it. More than enough. I had another infusion of Orencia today. I was really excited to see my old infusion nurse there. I asked about the old-new infusion nurse, if she was taking vacation days, but she is GONE, which mightily made me happy. Apparently other people had complained about her. I hadn’t, as I hadn’t wanted to seem whiny, but the truth of it was that she was not careful with me and she insisted trying veins that I knew and told her would not work for me. *sigh* So the old infusion nurse is back. YAY! Unfortunately my best vein is no longer my best vein. Something happened to it while she was off working in x-ray land and now it has a kink in it. It could ease out or I could be left without this happy vein as an option. Who knows. I’d like it to repair itself. 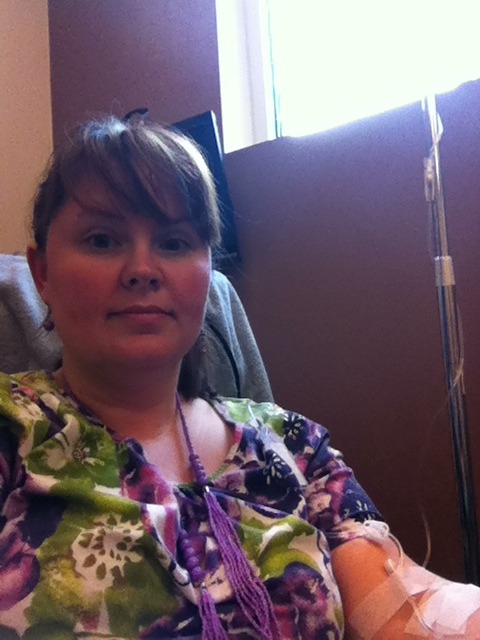 Having the infusion in my other arm impedes my ability to get things done during my infusion, like writing, and I’m really trying hard to get back in the habit of daily writing again. Anyway, I talked to my doctor about the flushing and heat issues I’m having. He hadn’t heard of anything like that, but the nurse later told me that she hears that complaint all the time from other patients, so now I’m a bit confused. Has anyone else heard of this? I’m pretty much constantly feeling overheated and I work up a sweat quite easily. I can’t find anything on the internet on my searches, but maybe y’all have heard something? I see my primary care physician next week for my usual round of bloodwork and stuff. I’m going to ask him about it and also about how to lose weight. It seems like every time I hit the gym I end up with an infection or complication of some sort, so I’m going to ask for his advice on what to do. It would really ease my pain to weigh less, but I’m going to need some help. January 4, 2013 Lisa H.